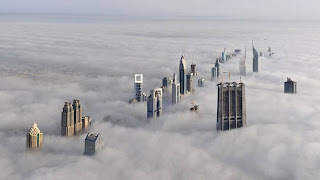 Dubai City -- the fastest growing metropolis on earth, with reportedly 1/5 of the world's construction cranes currently at work in a minuscule area consisting of only 35 square kilometers in size. Dubai City -- the most obvious symbol of the unfathomable growth of Arab wealth in today's new world order. Pretty amazing, and, at the same time, pretty damn frustrating. Needtovent briefly wondered if there exists anywhere in the Western world a location where both the standard of living and the feeling of unbridled optimism is keeping pace. Want proof? We still don't have a single, solitary building crane at the World Trade Center site which remains a defeated and desolate scar on the Big Apple landscape. Like much of the Big Easy, both are symbols of unacceptable American apathy awaiting a real commitment to rebuild. To restore. To revitalize. ...but that of Mustard Gas.